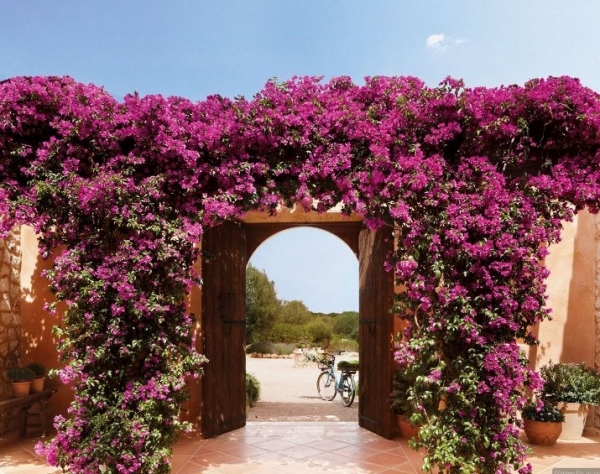 This lovely home, located in Mallorca, Spain, is surrounded by lush gardens and beautiful flowers. It has multiple outside seating areas, and a lovely cozy interior. The first outdoor seating area has a wood table and wicker chairs. 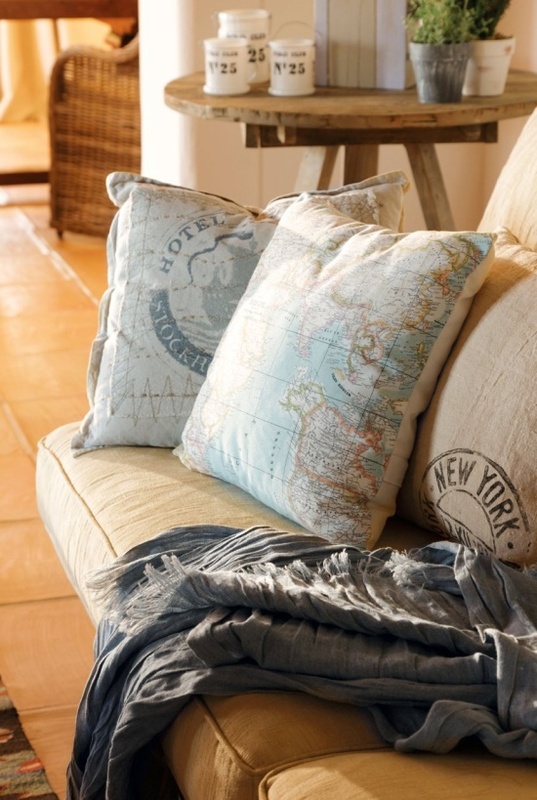 White cushions, and brown and white striped pillows fill out the seating. 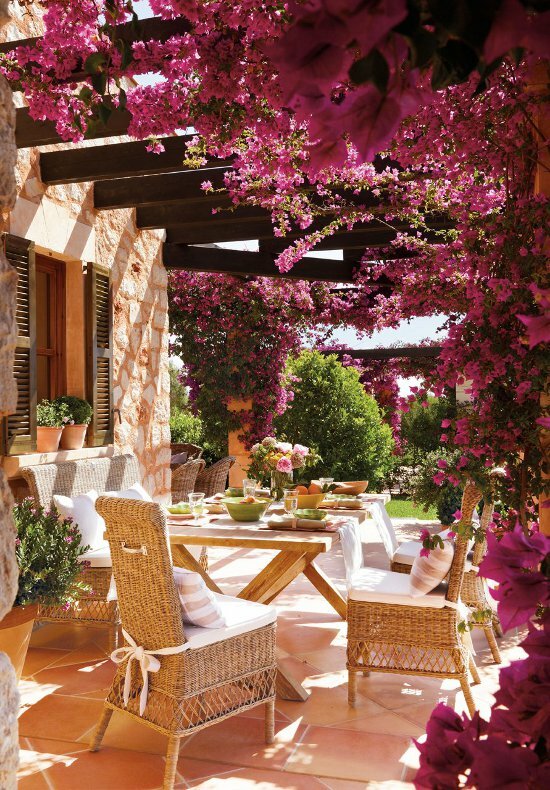 Large dark wood beams are attached to the home, and cover the patio, producing some shelter from the sun. 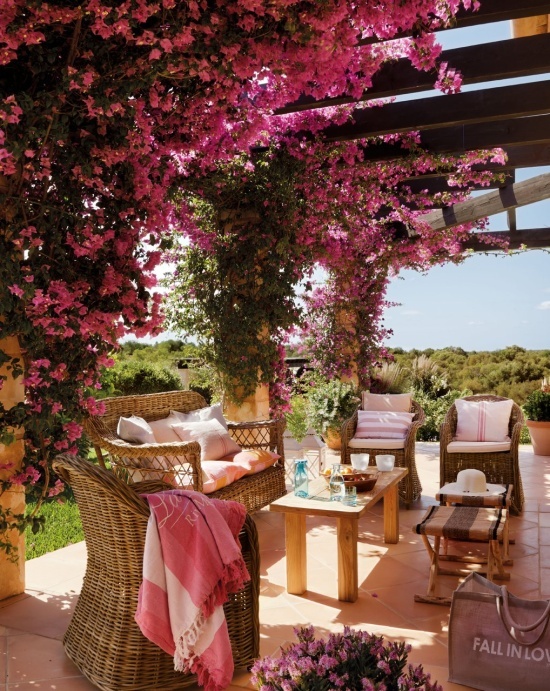 Next patio, positioned to view the expansive views, has three wicker chairs, and a wicker love seat. 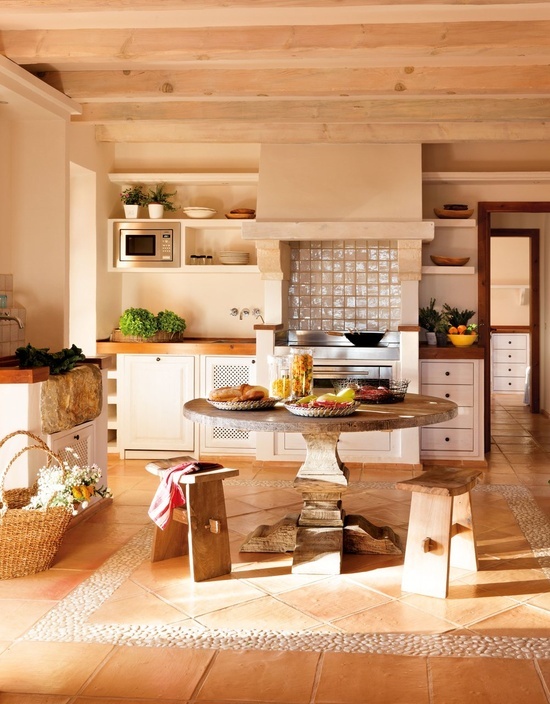 A simple wood table and two stools, complete the space. 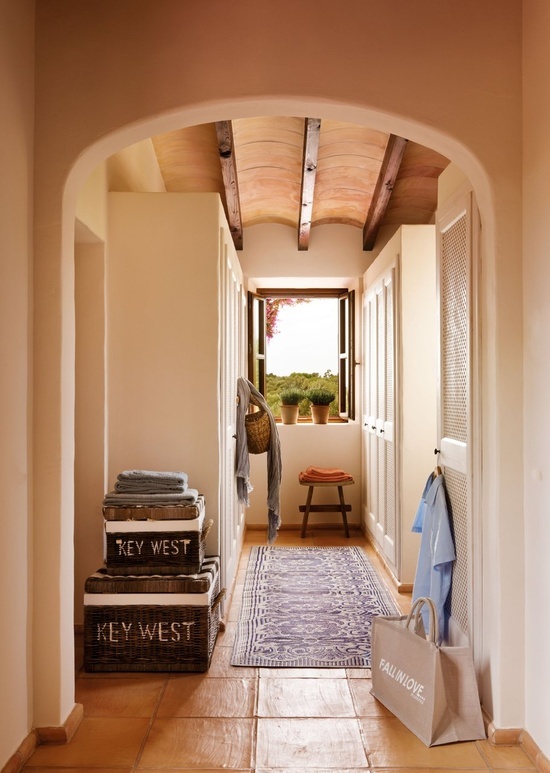 Large wood beams provide shade, and color accents, are mainly provided through the combination of red and off-white. The third patio area has a detailed metal table and complementing chairs. White cushions and pillows also fill out the seating area for this space. It doesn’t have covering, but it does have plenty of flowers, plants, and trees, for cooling. 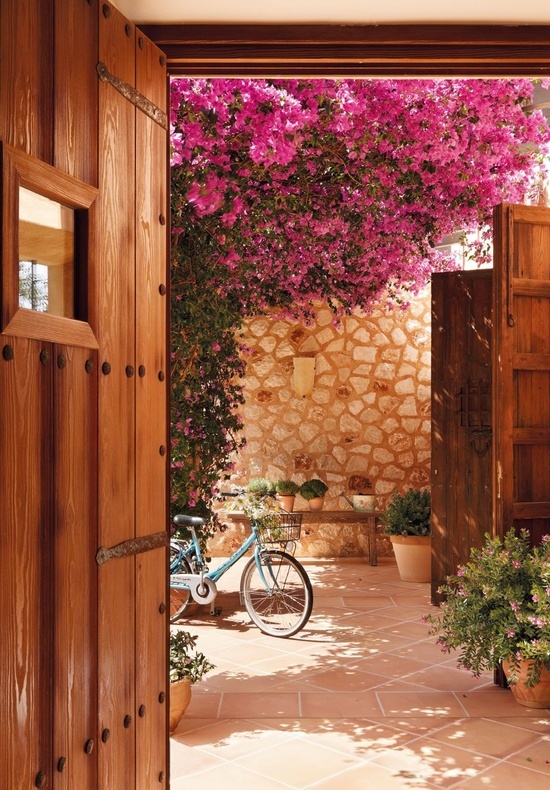 In an entrance area, the stone exterior, tile flooring, and large wooden doors, make for a beautiful space. 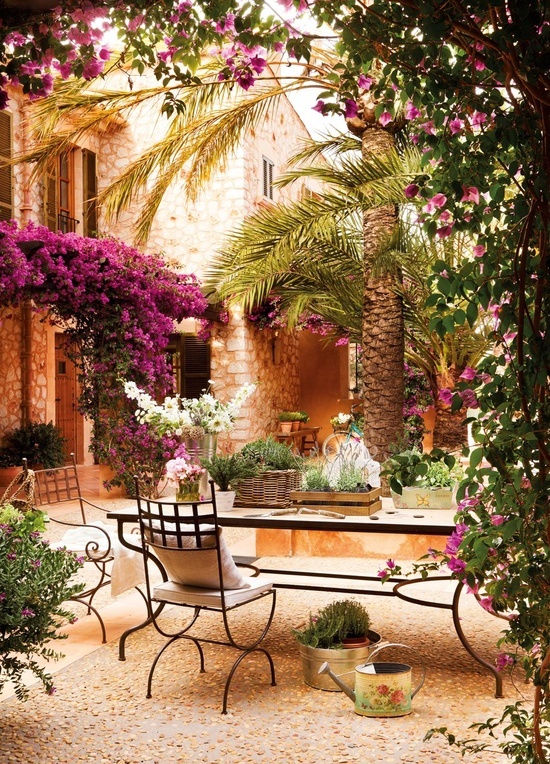 A bench and numerous pots of flowers, fill out the space, elevating it to picturesque. The eat-in kitchen has a beautiful round table, accompanied by two stools. Open shelving, and white drawers and cabinets, provide storage space. Tile backsplash is used over the stove, and the beautifully oversized stone sink. 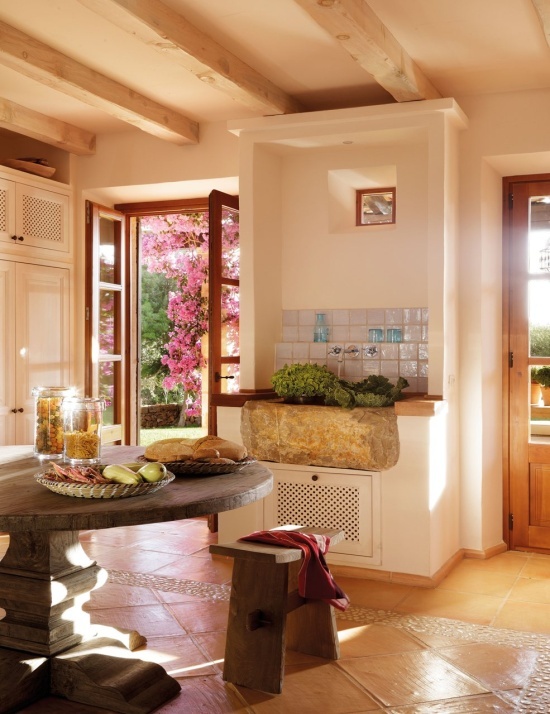 French doors open to one of the many outdoor areas, in this lovely home. 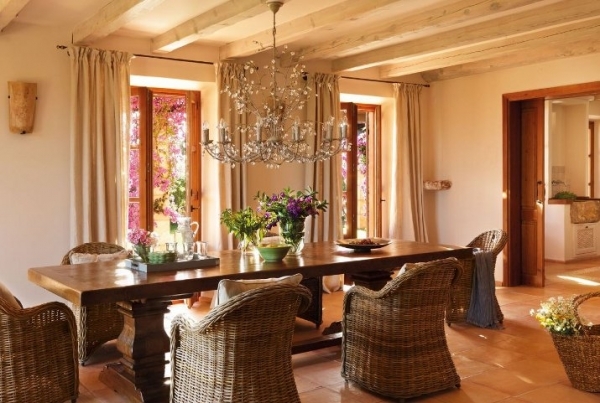 The dining room has natural wood beams, wicker chairs, and a long rectangular wooden table. Over the table, hangs an ornate chandelier with gorgeous crystals. French doors and long curtains line the walls in this room, letting the natural light shine in and through. This dream home is a decadent space, rich with nature on the outside, and warm and comforting on the inside; simply ambrosial.